The exciting tour of Powerhouse Theatre Company’s well received production Suffragette continues! 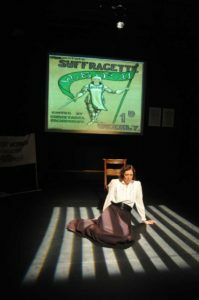 Suffragette is a one woman show written and directed by Powerhouse’s Artistic Director Geoff Lawson and performed by Anna Loveday. The play is a fictional, but historically accurate story of the Suffragette movement in which Anna plays 23 different characters. It is in turns exciting, funny, moving and extremely interesting and includes songs, both original and from the period. It is accompanied by brass ensemble, piano and guitar and features projections of images from the period, projected behind the actor, which adds to the atmosphere and story. So far we have performed four sold out performances at the Mill Theatre in Guildford, and have also appeared at the Vera Fletcher Hall, Thames Ditton, Nomads Theatre, East Horsley, Fire Station Arts Centre, Windsor and twice at Strode’s College, Egham. The tour continues in the new year with performances across the South East.The production is very suitable for schools and colleges, particularly those with History GCSE and A level. If you would like to book us, please use the contact form on this website. As a woman and feminist I was curious to see how a male writer would do on this subject. Well, the answer is brilliantly. Lawson’s production combined just the right elements of humour and emotion. He covers horrific realities like female hunger strike inmates being tube fed. By incorporating simple song and well placed backdrop images I was captivated. The actress Anna Loveday embodied the characters passionately and had no trouble encouraging some audience participation! Fabulous show. I’d love to see it on a bigger stage! 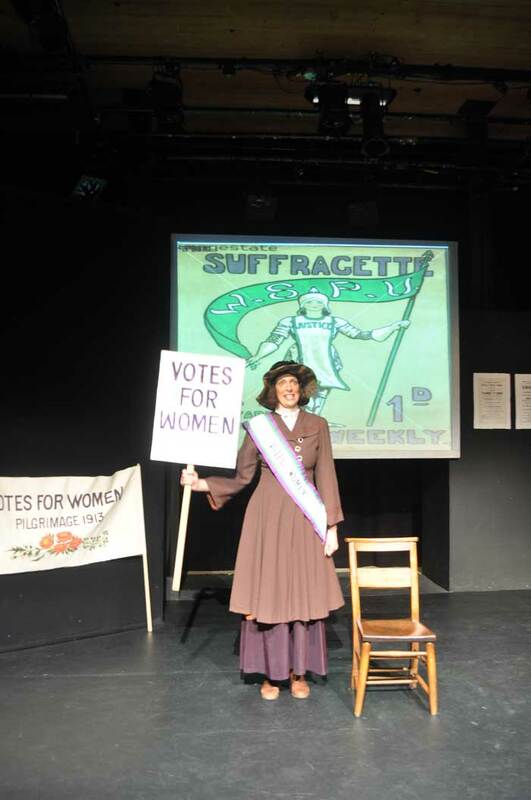 There were House Full signs for ‘Suffragette’ written and directed by Geoff Lawson at the Mill Studio Theatre, Guildford. Presented by the small but dynamic theatre company, Powerhouse, the 75 minute production about the fight for woman’s suffrage was played out by actor Anna Loveday – who narrates and adopts the roles of leading suffrage women. Lawson’s choice of a one act production, added to the intensity of impact. A story of commitment, courage and criminality is revealed but one that achieved an absorbing clarity as the ‘politics’ unravelled. 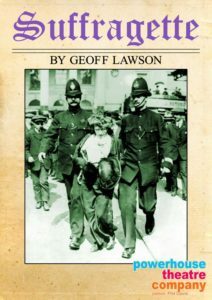 The ‘criminality’ originated from acts of civil disobedience by women from the Suffrage Movement but as their campaign failed to achieve progress, the movement stepped up direct action with increasingly violent protest and criminal damage; so too were the punishments with severe prison sentences introduced and for those on hunger-strike, forced-feeding; an unpleasant business as we were to see. 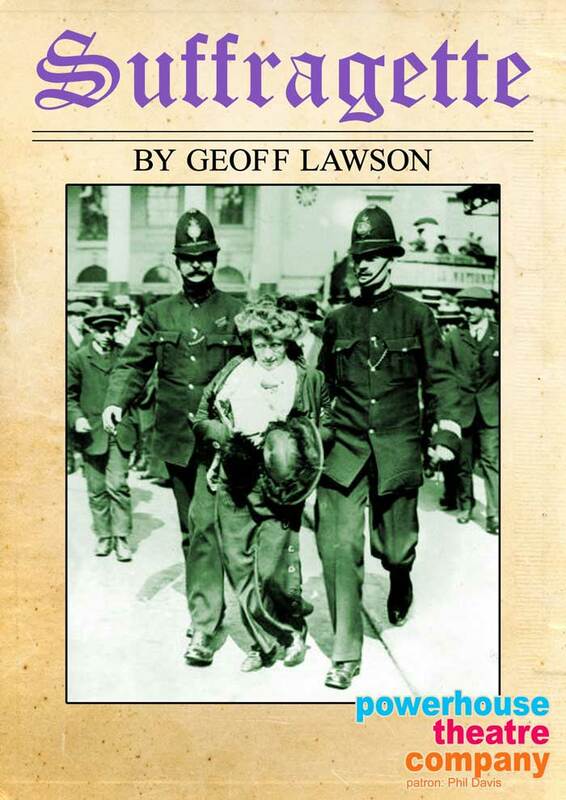 Lawson throws up on a large screen a series of dramatic Stills that illustrate leading personalities, the results of direct action, some arrests and dramatically, prison photographs of forced-feeding in progress. These culminate in activist Emily Wilding Davison’s death when she attempts to impede the King’s horse at the 1913 Derby. It is a tour de force forAnna Loveday narrating and acting out the story and her strong voice was heard to advantage when delivering parlour songs and ‘battle hymns’ from the period; a clever gesture was to invite audience participation in some songs. Musical direction was by Sarah Jones who led a small but effective band that added much to the direct experience. In 1918 women over the age of 30 gained the vote but in 1928 universal women’s suffrage was passed into law; the announcement won a cheer from the Mill Studio audience. This one-woman show is a compelling mix of versatile performance, original live music, and historical research and interpretation – all of which combine to bring a fascinating and important moment in our nation’s past to life. The show is both educational and entertaining, and succeeds in imparting an account of events whilst generating empathy amongst the audience for the female characters portrayed. This is in no small part due to the exceptional abilities of the leading lady, who convincingly shifts from character to character; one truly forgets at times that one is watching the same person! I think it would be interesting to develop some of the ideas and themes present in the show, for instance by contemplating women’s current relationship with politics and feminism in the UK.